We can offer you a delivery and collection service for your pet so if you don’t have access to a car we can pick them up at a convenient time and drop them off when you come back from your holiday. The cost depends on mileage so please give us a call on 01494 881521 for a price. Whilst you are away on holiday and your dog is boarding with us we can take your dog swimming, we will split the sessions into 2×15 minute swims, this is charged at £14.00 for 1 dog, £21.00 for 2 dogs and £24.00 for 3 dogs, just let us know if you want your dog to have some swim sessions when you bring him/her into stay. We offer a bath service which we do the day before your dog comes home. It costs an extra £15.00 on top of their board. 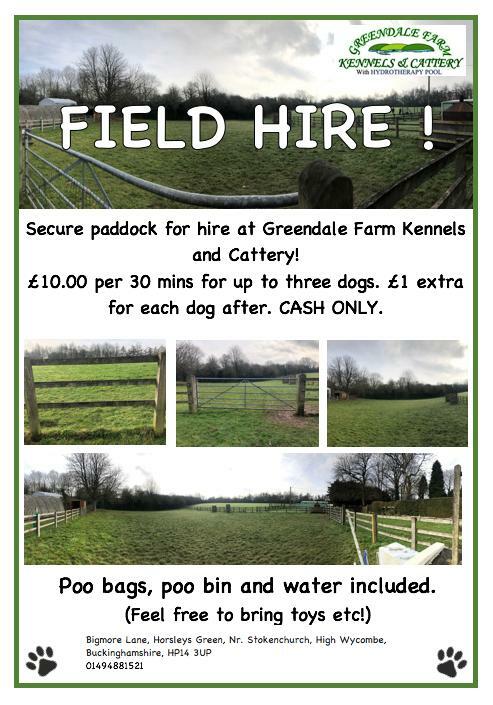 Secure paddock for hire at Greendale Farm Kennels & Cattery. Click here for more details.